Rat Inspection - How Are They Getting In? This is the key - you will never solve your rodent problem in a building until you can find out how the rats are getting into the building in the first place. They can get in via so many areas - they only need a hole the size of a quarter, or a gap that is about 3/4 of an inch. Heck is seems like even 5/8 inch is fine. 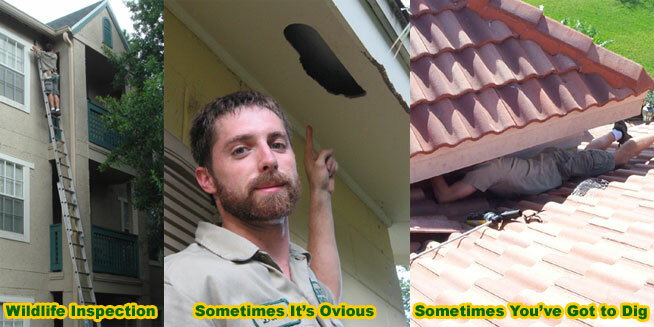 Check every vent - gable vents, roof vents, ground-level crawl space vents, even the laundry vent. Check all doors and windows. Check every part of the roof, especially the fascia, and wherever an eave meets the roof. Check all roof lines. If you have a tile roof, you've got a TON of entry spots. Check plumbing stacks, air conditioner chases, power line enry points, basically, EVERY SQUARE INCH OF THE HOUSE. Here are four small examples of easy-to-spot rat entry points. In the upper-left, there's a hole that's been chewed out at the end of a gable intersection with a roof. 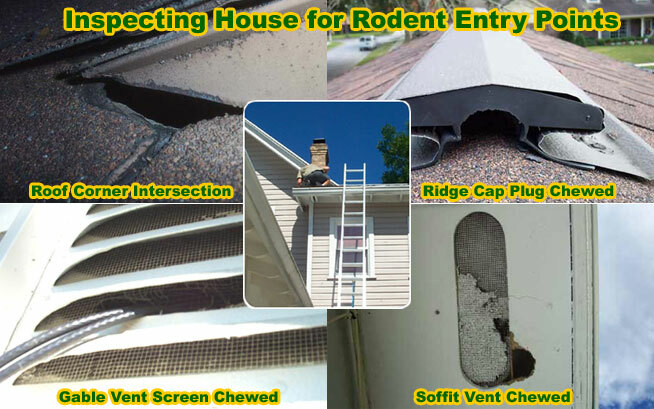 Roof edges, and anywhere where roof meets roof is a rat entry hot spot. In the upper-right, a very obvious chewed-open ridge cap plug. The open ridge cap goes right into the attic, of course. This is a popular rat and mouse entry point. In the lower-left, it's some wires going into a gable vent, and only a flimsy screen blocks access. You can see how easy it is for the rats to chew through and slip into the attic. In the lower-right, it's a chewed out hole by a soffit vent. Never mind that the cover is in place, rodents can gnaw a hole open in the wood. Read about What can rats climb? If you're not experienced with ladders, and you MUST use ladders to check all of the critical roof points, then be careful! Wear a safety harness, and have a spotter. Same with working on the roof, which you must do. An experienced guy like me can scramble all over a steep roof with no trouble, but I wasn't that way as a beginner. When you go in the attic or under the house, wear a respirator, and maybe even a protective suit. I also always wear gloves, and a head lamp is very helpful in dark attics and crawl spaces. WHY IS THE INSPECTION IMPORTANT? You have to find out how rats are getting inside the building. This is absolutely crucial! Those rats are entering your home and attic somehow. You will NEVER solve your rat problem unless you find ALL the entry points. Every single last one. One little failure, one missed spot, and you will have rats in your attic or house forever. You must inspect the whole structure, from the ground up, including all portions of the roof, and the plumbing system. Check vents, eaves, roof joints, plumbing stacks, AC chases, the chimney, EVERYTHING. You must be completely thorough. An intimate knowledge of rat behavior and building architecture helps a great deal. Know what signs to look for - brown staining and grease at entry points, gnawing, etc. Also, inspect in the attic, where you will see rat trails that will help you identify entry points, and you'll spot rat damage that you'll want to fix, such as gnawed wires or pipes. The above photo reveals a pretty easy rat entry point. You can see what happens. Rats love to find small holes and climb pipes and wires up walls and into the attic. But most entry points are not this obvious or easy to reach. Sometimes rats can get in under the house, even by digging. Read about Do rats dig holes? Do they burrow under houses? How deep? I often have to crawl in very tight spots in order to find all the rat entry points. I also, more importantly, have to know exactly what I am looking for, and why. Follow the trails of grease marks and droppings. Use an ultraviolet light to see rat urine glowing in the dark. Sniff around. Think like a rat. Well, I don't mean that in some lame redneck trapper way, I just mean that you have to be willing to carefully inspect anything a rat might be able to use, and understand rat behavior. There are also many little tricks, such as getting a full understanding of where the rats are making noise. Click here for more info about rats making noise at night, and you can gain some clues about the entry areas. Although I wrote this site with rats in mind, such as the Roof Rat and Norway Rat, the same principles apply to other rodents, such as the house mouse. Mice behave very similarly to rats, they're just smaller. Email me if you have any questions about inspecting a house for mice. In short, they can get into much smaller holes, like the size of a dime, or a 3/8 inch gap.